My sister is messy. Messy may be an understatement. But we will stick with that. She's recently gone to Queensland to stay for an entire month, so my mum and I decided to tackle her room a bit while we have the chance. Including but not limited to throwing out lots of trash, vacuuming and washing all of her bed linen etc. 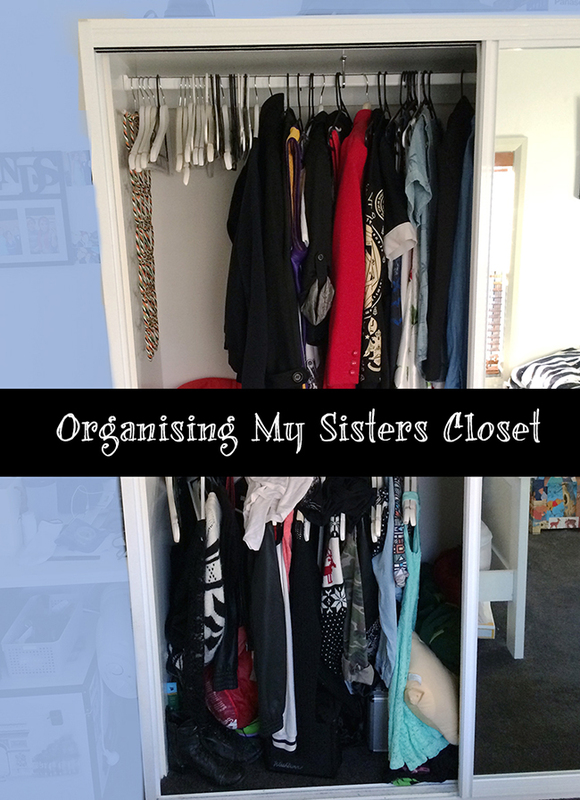 I decided to organise her closet mainly because I actually enjoy organising. Ha. Do I have a problem? Maybe. But can you organise too much though? Probably. If I had a label maker I would most likely reach that point. *labels dog* "DOG"
To start off with she had so much stuff in there that wasn't even on hangers?? As well as lovely white wooden hangers that she picked up for a bargain from a closing down clothing store. There was no order to how stuff was arranged. There was so much crap underneath though as well. Paper lanterns, slippers, stuffed animals, an inflatable pirate chest?? an amp, a mini case with a microphone and 3 backpacks. As well as two onesies. I took everything out. All of the clothes, hangers, shoes and random crap. Everything that was on an ugly hanger I removed and replaced it with the lovely white hangers. I rehung everything nicely, organised the shoes at the base, stored some stuffed animals and her amp above her closet. Put the bags in the corner near the shoes. I hung everything up according to type, shirts down the bottom, jackets, sweaters & coats to the top right. Dresses & overalls on the top left. And all on pretty white hangers. You can see her shoes and slippers neatly arranged on the bottom. So now she can actually see what clothes she has hanging in there ! If you're seeing this Kayla. You are welcome! ha. 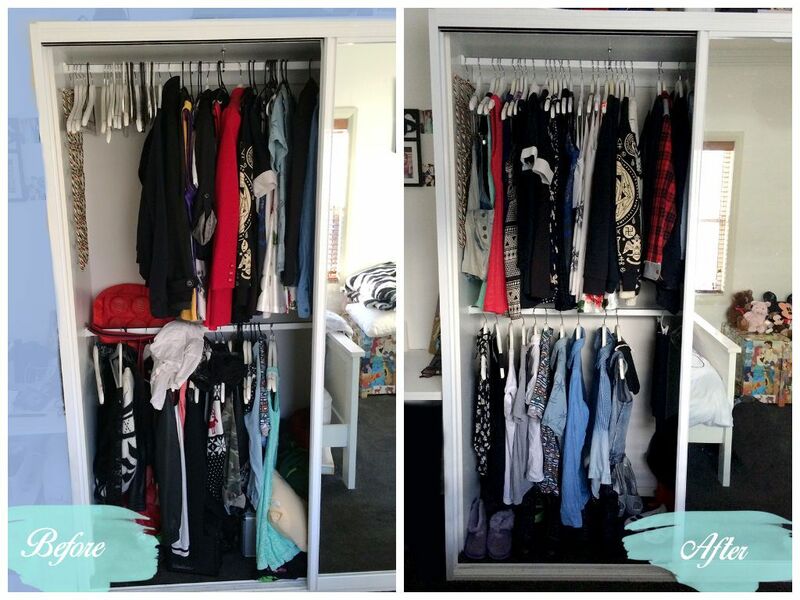 For my collection of closet inspiration, follow my "Closets" board on pinterest! I'm loving how people have wallpapered the back of their wardrobes! 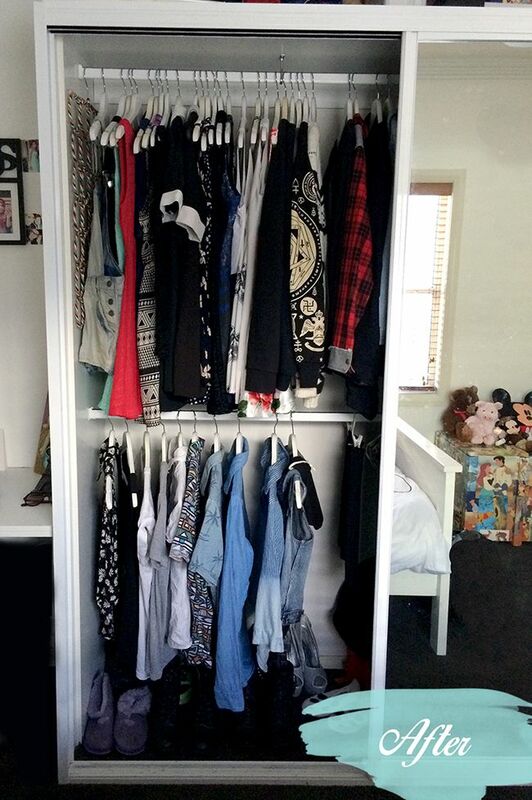 Follow Tegan Seymour's board Closets on Pinterest.